VMware vCenter Support Assistant Appliance: Cannot connect to the lookup service at the specified URL. VMware vCenter Support Assistant Appliance installation step 1 – Configure “Lookup Service address” failed with the error message: “Cannot connect to the lookup service at the specified URL. Check if the URL is correct”. must provide the lookup service address. In the Lookup Service Address text box, type the vCenter Lookup Service address. You must provide the lookup service address to register vCenter Support Assistant components with vSphere. vCenter Support Assistant establishes a connection to the server. (Optional) Click Show Details to view the full certificate details and click OK. Yes, you can use the server name, BUT you must use the FQDN! And it is not just that I afraid! The service address is CASE SENSITIVE! I.e. if your vCenter Server is using self-signed certificate and during the VM deployment computer name was typed in capital letters, then the certificate would be issued to something like SERVER.domain.com. 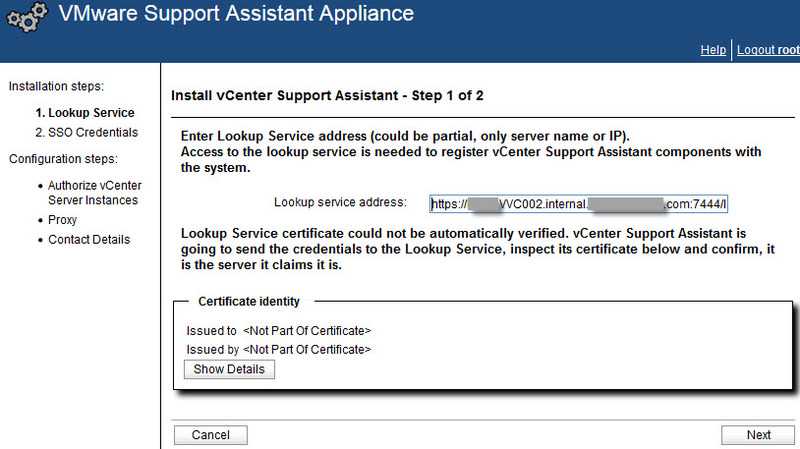 3 comments to VMware vCenter Support Assistant Appliance: Cannot connect to the lookup service at the specified URL.